"While there is no broad consensus for the Brexit deal, the decision ought to be put back to the people in a second EU referendum - that is the responsible and democratic thing to do." Scotland voted to remain in the European Union. Find out more about the Scottish Government's position on EU Exit. Cyber Scotland Week (22 to 28 April 2019) is a joint initiative between ScotlandIS and the Scottish Government aiming to bring together innovation and learning across the cyber resilience landscape. Look for a policy using keywords or filtering by available topic areas. 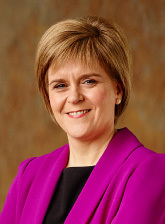 As head of the Scottish Government, the First Minister is responsible for the overall development, implementation and presentation of the administration's policies and for promoting and representing Scotland at home and overseas.